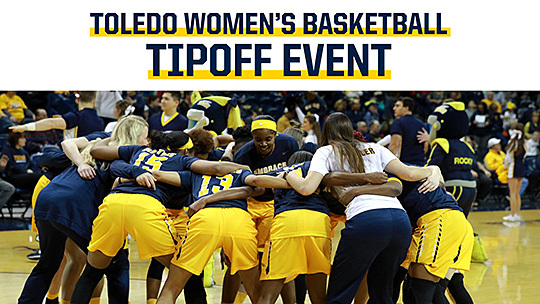 Toledo will hold a Women’s Basketball Tipoff Event Tuesday, Oct. 23, at 6:30 p.m. in the Thompson Student Union Auditorium. The cost for the annual fundraiser hosted by the Rockets is $55 per person, $100 per couple, and $10 per child age 12 and younger. All proceeds will go to the UT women’s basketball program. Attendees also can reserve an eight-person table for $500 or purchase the MVP package for $1,000, which includes a reserved table for eight and a signed Toledo basketball. Attendees will be treated to live music and food donated by local restaurants while vying for numerous prizes throughout the course of the event. In addition to music and prizes, this year’s event will feature current Women’s National Basketball Association Seattle Storm Head Coach Dan Hughes. A two-time WNBA Coach of the Year, Hughes also served as an assistant coach for the UT women’s program in 1996-97, as well as on the UT men’s squad from 1991 to 1996. The Storm last month won their third WNBA Championship in franchise history with a three-game sweep over the Washington Mystics. For more information or to reserve your spot/table for the event, contact Lauren Flaum, director of women’s basketball operations, at 419.530.2363 or lauren.flaum2@utoledo.edu. RSVPs are requested by Thursday, Oct. 18. This entry was posted on Friday, October 12th, 2018 at 3:28 am and is filed under Alumni, Athletics, Events .